The wrong choice of Plastic drum, whether open head or tight head, may result in the contents being contaminated, failure of the drum, severe fines and/or penalties for noncompliance with DOT regulations, or the loss of business as a consequence of the inability to solve the problem due to lack of knowledge and expertise. Q: How do I know which plastic drum to specify based on the material being shipped or stored? A: Most plastic open head and tight head drums used for industrial purposes are made of HDPE (high density polyethylene), and are manufactured by a process known as “blow molding”. Another process used to manufacture plastic drums is “rotational molding”, which is specified less frequently due to higher production costs than blow molding. It is important to be aware of the compatibility of the material being shipped and stored with the HDPE. Q: How do I know if the contents that I plan to ship and/or store in a plastic drum are compatible with HDPE? A: The best source of that information would be from the supplier of the material being packaged. An MSDS (Material Safety Data Sheet) can be requested from the manufacturer or supplier of the material. Q: How do I determine whether to use an open head or tight head plastic drum for my application? A: Open head plastic drums come in a variety of sizes, shapes, and colors that are best suited for specific applications, and are best suited for shipping and storing solid materials. They can be straight sided or nestable (tapered). 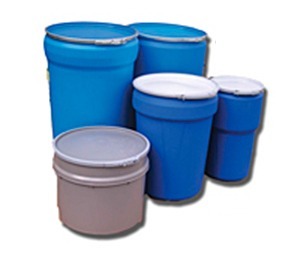 Tight head plastic drums also come in a variety of sizes, shapes, and colors, and are best used for shipping and storing free liquids that require a more secure closure. Q: What types of closures are available for both open head and tight head plastic drums? A: Open head plastic drums with removable lids can have either a bolt or a lever style ring closure. Screw lid closures are also available on some types of plastic drums. Tight head plastic drums can be fitted with threaded screw cap fittings which provide more security when shipping and storing free liquids. Q: How do I know which type of plastic drum to specify, open head and tight head, if I intend to ship a hazardous material? A: If the material being shipped is hazardous, under the HMR (Hazardous Material Regulations), the offeror of a hazardous material for transport is required to select the appropriate package best suited for the specific application. The offeror must consult the Hazmat Table found in the HMR in order to determine the appropriate package selection. Youngstown Barrel & Drum Co. has been in business over 60 years as an industrial container specialist. As an integrator of multiple related industrial packaging, drum storage products, and both rigid and flexible containment products through one source, Youngstown Barrel & Drum Co provides the highest level of expertise and service, at the most competitive pricing. For a competitive quote or more information, find the best supplier of plastic pails and buckets for your business at 1-800-359-DRUM.